During a domestic argument in Lurgan a 29-year-old man grabbed his partner by her throat and held a knife to her chest. And he told her he was going to kill himself with the knife and that the both of them would die together. Andrew Brian Liggett, Dee Street, Belfast, was sentenced last Friday at Craigavon Magistrates Court for making a threat to kill a female on June 24 this year and assaulting her. 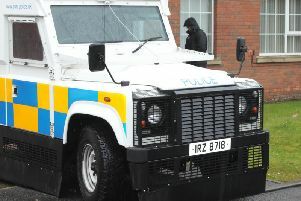 The court heard that at 9.35pm police went to a property in Lurgan after a report of a domestic disturbance. The injured party said that her partner, the defendant, and she had been drinking when he became abusive and aggressive towards her. She claimed he held her by the throat and choked her for about five seconds and that he had a knife to her chest. The injured party said she tried to make a phone call but the phone was taken off her. Liggett then threatened to kill himself with the knife and that both of them would die together. They sat down to try and calm things down and when he went to get her a drink of water the injured party went to a neighbour’s house. A barrister representing Liggett said it was accepted the facts showed the defendant in a very negative light. He added the knife had been an issue between them and his client would say he only had it to make sure she didn’t do anything silly. The lawyer said the relationship had come to an end and asked the judge to stay his hand from imposing immediate custody. Deputy District Judge Chris Holmes said he was not impressed by the defendant’s denial to probation but he thought the case ‘just about’ didn’t justify immediate custody. He imposed a combination order of 100 hour community service and 12 months probation, ordering Liggett to pay £500 compensation to the victim. The judge also imposed a restraining order for three years.